It’s true. But. If the road to there is paved with the good intentions of the good but misguided…who or what guided them there and what are its intentions? Beautiful imagery BTW, but as implied Zero, McCain’t and countless others -sadly even Skye and her gullible ilk- are vessels…it’s the Boss we need to identify and destroy. Rock groups talk about a “Highway to Hell” and a “Stairway to Heaven.” Are they thinking about anticipated traffic volumes? That was what Jesus said, too. the gate is wide and the way is easy that leads to destruction, and those who enter by it are many. But small is the gate and narrow the way that leads to life, and only a few find it. I can almost hear Chris Rea cranking up “Road to Hell”…. There’s that song too, but I was thinking of AC-DC. Nice job, CM. Nicely done. I was thinking the image is where the lava has been flowing to the sea on the island of Hawaii for the past several decades. (Don’t know if it is now after the other lava eruptions last year.) If so, it can be very dramatic. I saw it once from inland, and from where I was standing with the smoke and steam and such it looked as though the Gates of Hell were indeed open. If Madam Pele, the Hawaii volcano goddess, had satanic characteristics, I would suggest two currant entrances to Hell. But she’s more neutral, if my foggy memory of Hawaiian gods and goddesses is accurate. She is easy to offend but doesn’t cause bad things without being provoked. The lava fields bordering the ocean on Hawaii’s slopes look a good deal like the lava field that has grown and grown since 2006 around Erta Ale. I’d say it doesn’t matter where it’s located: they all look the same. So much TRUTH in a single strip. The temptation is always to bring it back to a single identifiable evil character… whether it’s Obama, Satan, Hitler, pick your figurehead… but the reality is far more nuanced… The potential for evil hides in all of our hearts and if you don’t believe that, Satan wins. We Lutherans say “the Devil, the world, and our own sinful flesh” are the tempters. Truth there brother, and the daily struggle to not let it loose is what some call life. Thank you Lord for the blessings on our lives, and thank you for the Holy Spirit as it rests on us and those around us. Amen. Not just potential but evil itself lurks in the imperfect hearts of mankind. And while Satan confidently awaits the perdition of the many who succumb to its temptations it is his agents of it who show and guide the way there. Sheep are easily led astray, and those who shepherd them are absolutely agents of the devil himself and deserve an even greater punishment. If that special place exists which I believe it does, reserved for those who use God’s name to commit their evil ala the corrupt Vatican and its spawn, then it also must have room for those like Obama, Hitler, and the other evil despots both historical and contemporary who with malice and murder aforethought use their charisma and silver forked tongues to benefit themselves and provide continuing unlimited lost souls for the devil’s darkness. And while I absolutely believe that is the ultimate and eternal ending place for them, I also firmly think that as Chris says and I state above they are still just vessels of the eveil and there is an earthly demigod among us who drives it all…who or what it is is the greatest mystery of the universe. Somehow, I can totally see this as truth. The question is if eternal Hell isn’t too mild a punishment for the Left’s Sleeper Cells, uh I mean “the free (gag) press”. Imagine how heavenly it would be not having to deal with their poisons for just one day? Let’s hope Jussie doesn’t think his best remaining chance at lasting fame is to go for martyrdom and he puts himself on the end of a noose he tied himself. We’d have decades of “the racist right” blamed for driving him to it, let alone the “Smollet truthers” explaining how it was a Chicago PD coverup of a murder ordered by Trump’s FBI. Nah, Nike will hire him as a,spokesman quell their disinteresting shoe problem. Remember, they did the crapperdick thing to boost their “Just screw you” campaign. “Disintegrating”.. in retrospect, both work equally well. Karma is like that. If they’re lucky that’d be one of their campaigns that gets pulled so fast practically no one knows it happened. Like when they had only “Just do it” under a pic of Caitlyn Jenner. Sound doubtful? 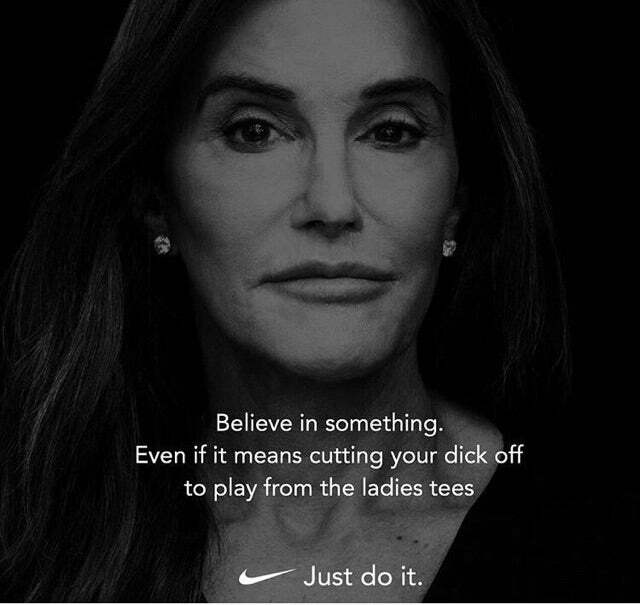 They tried to salvage it for the “believe in something” push, view it here. It is said that the way of the transgressor is hard. Seems to me that it’s hard because it’s so crowded. Jim Treacher’s widely quoted tweet is correct. I had an example of that handed to me just this week. An otherwise intelligent and well informed individual of my acquaintance declared his disbelief that Antifa took over the streets of Portland Oregon some time back. It never occurred to him that his news sources had conspired to keep him ignorant. Iowahawk has some very good insights. That’s one of my favourite Churchill quotes. There’s a reason why Churchill won a Nobel prize for literature. Expect to hear from Meghan McCain for depicting her “sainted” (koff!) father in Hell. I wonder if the Road to Hell was paved using Union Labor from California. Most likely there were cost overruns and issues with quality. Plus all the damn AQMD regulations and rules that needed to be followed. Don’t get me started on the Carbon Footprint offsets. Roads contain materials known to cause cancer in CA. Hell, apparently everything causes cancer in CA! All the news in print gives me fits. Too bad certain people aren’t getting there soon enough. Now now Let us be gracious about these things. Everyone needs every last second of their time on this Earth to repent. Granted, there are those bound and determined to maximize their sins, but even they serve as examples to the rest of us. I thought the modern newspaper banner was “All The News That’s Filth To Print”. At least there are papers still around for parakeets to poo on. Yeah, what are we going to do when they run themselves out of business? It’s getting harder and harder to get that kind of paper delivered to your house. It’s useful for the already mentioned parakeets, the proverbial fishwrapper, even stuffing wet shoes so they dry faster. 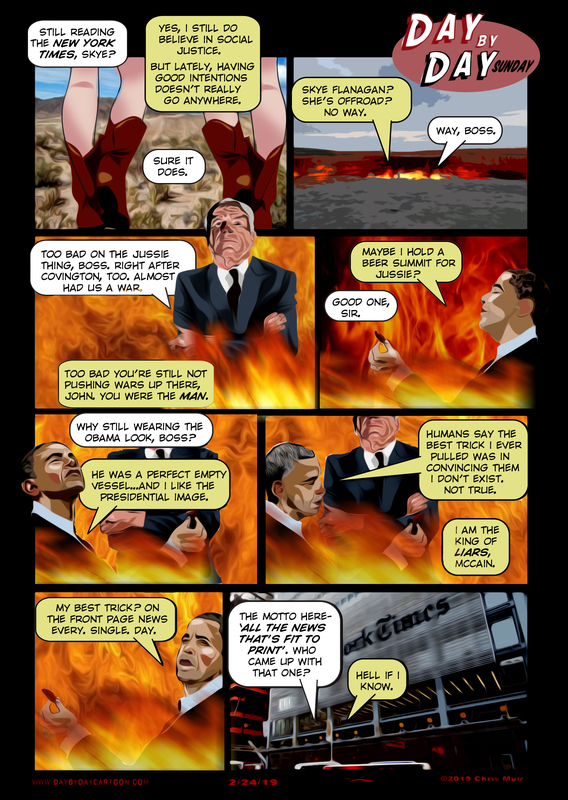 An apt description of O’Bozo by Satan. Astronomers have confirmed nearly 4000 exoplanets in Earth’s neighborhood with many thousands more awaiting confirmation. Planets seem quite common, each star averages about 5 or 6. There’s about 400 billion stars in just our galaxy. There are a lot more than 400 billion galaxies in just the visible universe. Our minds can’t comprehend how much is out there, too much to ever discover let alone explore. Atheists are certain there is no God anywhere in the universe, here or elsewhere. Communism cultivates, even demands, atheism. And Atheists and Communists are both perfectly certain they are absolutely right.